Oil changes are just one of the many auto services we offer at Liberty Auto Centers. After 32 years in business, an oil change is one of the simplest tasks we handle on a daily basis. Our customers in Maryland visit our service center to receive quality, affordable service they know they can count on. Such quality has long been our goal with each type of service offered, including something simple like an oil change. Whether your vehicle requires conventional, high mileage, or synthetic oil, our comprehensive preventative maintenance will inspect, flush, and refill your entire system to make it like new. Our expert technicians will visually check each step in the process, ensuring absolutely nothing goes wrong. We complete oil changes quickly and professionally. Four main types of oil are currently available on the market: conventional, high mileage, synthetic blend, and full synthetic. Each has their own benefits and downfalls, of course. Some vehicles function more efficiently when the correct type of oil is used in the engine. Conventional – Conventional is considered good for basic engine protection. You will receive adequate performance and effective sludge protection. High Mileage – High mileage oil is designed for engines with more than 75,000 miles. The main focal point for high mileage oil is that it helps to replenish worn or leaky seals, restore lost compression, and reduce overall oil consumption. Synthetic Blend – Synthetic blend oil offers better protection, performance, cleaning, and fuel efficiency when compared to high mileage oil. With the added benefit of protecting the engine during extreme temperatures, synthetic blend oil is a clear choice for many vehicle owners. Full Synthetic – Lastly, full synthetic oil features all of the advantages of synthetic blend oils, but is better all around. Your engine growls more loudly than ever. Abnormally loud or strange noises from your engine could indicate that you don’t have enough oil in your car. Your check engine light is on, and won’t go away. Yes — it sounds simple. But, many people either overlook or ignore this. Pay attention to your check engine light! Your oil is full of gunk. If you spot various particles or chunks in your oil, you need to change it. Contact Liberty Auto Centers today if you have more questions! Full synthetic oil. Full synthetic oil is oil made specifically for high-tech engines. Premier conventional oil. This is the standard type of oil. It works well on almost all types of vehicles. Higher mileage oil. If you have over 70,000 miles on your odometer, you might consider higher mileage oil. This type of oil is designed for cars with significant mileage. Don’t hesitate to contact Liberty Auto Centers today with any questions about types of oil changes! 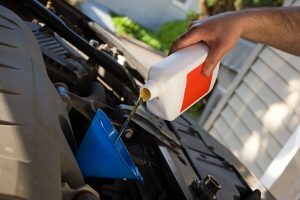 For the best oil changes and vehicle service around, call Liberty Auto Center today at 240-686-6613 (Flower Hill) or 240-912-5625 (Redland).